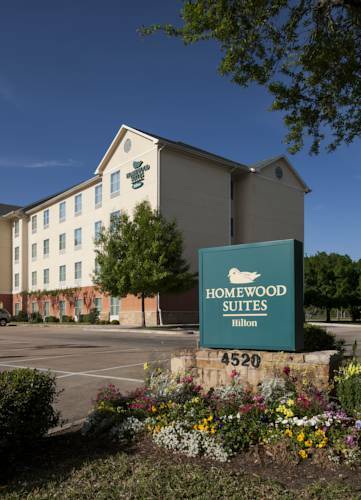 Homewood Suites by Hilton Houston-Stafford is conveniently located 17 miles southwest of downtown Houston Texas off the 59 South Freeway. Our extended stay hotel is close to major corporations the Stafford Centre Performing Arts Theatre and Convention Center Methodist Hospital and the University of Houston. Ride our complimentary shuttle during regular weekday work hours to businesses such as Yokogawa Texas Instruments Frito-Lay Chevron and Baker Hughes all within a three-mile radius of the hotel. Host a training session for 30 people or a reception for 50 in our meeting room. The Homewood Suites Houston-Stafford hotel offers 78 spacious studio and one-bedroom suites on four floors. Each suite has complimentary high-speed internet access well-lit workspace and fully equipped kitchen with full-size refrigerator and granite countertops. You can unwind in the outdoor pool cook out on the grill or play hoops on the sports court. Take advantage of our complimentary hot full breakfast served daily and evening dinner and drinks Monday through Thursday. Keep in touch using free WiFi during your stay.